It was the New Year holiday. 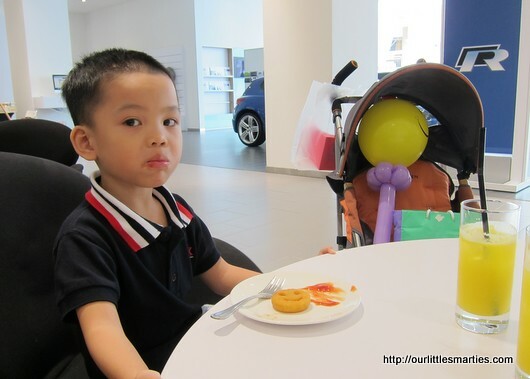 V brought us to the Volkswagen showroom at Alexandra Road. 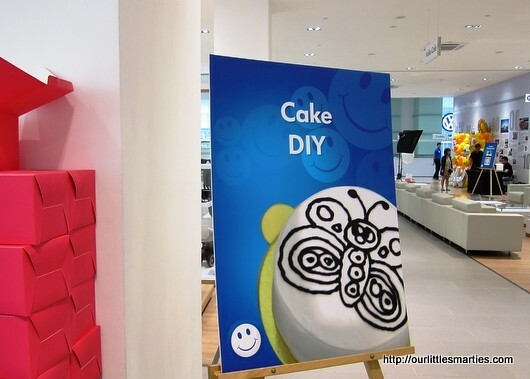 Much to our surprise, there were lots of fun-filled activities in the showroom in celebration of the New Year. To begin with, V intends to buy a new car this year. He wants to trade-in his Toyota Altis for the new Polo GTI. He loves its hot racy look and the electronic panoramic tilt/slide sunroof. Yes, it’s pretty cool and we’re all ready to feel the wind in our hair! I prefer the VW Jetta for its elegant and classy look. There is more legroom for rear passengers and maximum comfort for everyone. 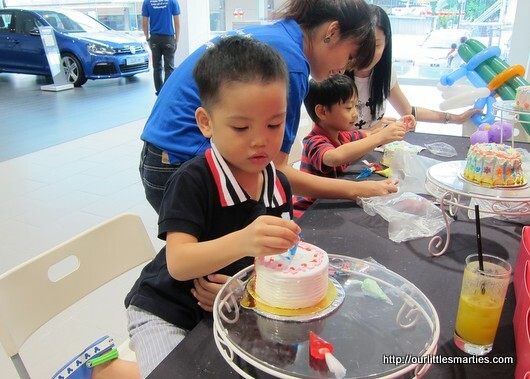 While V was busy looking at the cars, Little Edison and I joined the activities in the showroom. 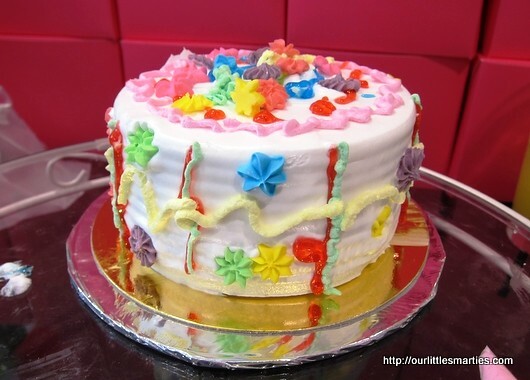 We started with Cake DIY – a cake decorating activity. We were given a 4” cake, icing décor and coloured piping bags. Our boy enjoyed himself so much. This is the cake decorated by our boy, with minimal assistance from me. He was so proud of his creation! Balloon sculpting, instant photography, snacks and ice-cream were also available. This is our boy enjoying his smiley hash brown with tomato sauce all over his mouth! It was a great afternoon. Thanks to Volkswagen! His Latest Favourite iPhone Game – Golf! Edison had a new haircut? Cool! Yes, his shortest haircut ever! The first thing that came to my mind after the cut was, “Oh my! My son looks like he is going for his NS!” Haha! But I thnk the short hairsyle quite suit him. Will keep his fringe slightly longer next time. VW! Das Auto! Good choice. It’s always an exhilarating drive. But I think the Polo is a tad smaller (probably not a concern since you guys have another family car). Golf is my most desirable hatch. Even the old FSI model is so powerful and the handling is superb. V, go for it! Nice to see you here. He chose the new Jetta Sports at last. Bigger and more leg room than the Polo. I agree that the Polo is a tad too small. He added the sunroof to the Jetta, so it takes longer time to get the car. ETA mid this year.